Motivation to continue studying from the reality of the company. 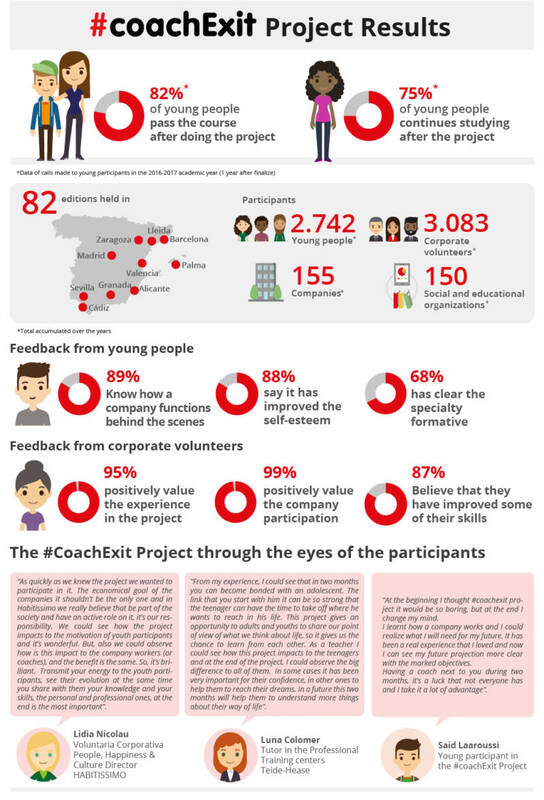 The Coach Project is a voluntary corporate initiative that tries to improve employment opportunities of young people at risk of social exclusion through Coaching and Mentoring. It is aimed at socially responsible companies that want to involve their staff in a gesture of solidarity for a limited period of time and with ensured results. To achieve this end, Fundación Exit trains voluntary staff of leading multinational companies with a social sense of responsibility so that they can act as coaches to these youths. This way, the young person gets to know the business world from the inside, discovers his/her vocation with the objective of continuing his/her studies. During 6 sessions, the volunteer leads the young person through the company introducing him/her to his colleagues and promoting team work.